SOUTH HADLEY – Although it didn’t have them crying, a tractor trailer truck which rolled over Monday morning spilling milk in the roadway left officials with quite the mess to clean. An 18-wheel Harris Milk tractor trailer truck flipped on its side on Alvord Street just past Brunelle’s Marina before McCray’s Farm after the driver, traveling south bound, failed to negotiate the turn. 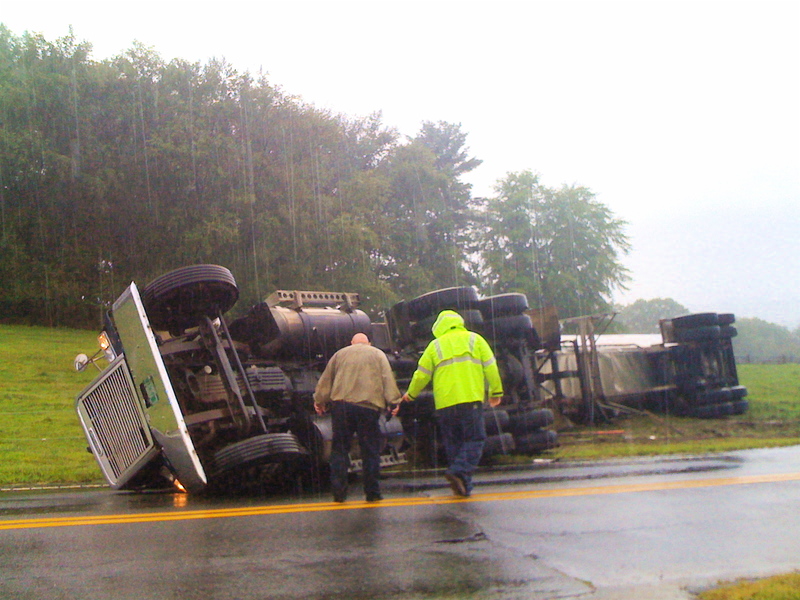 The Belchertown company’s truck skidded to the side of the road at 10:56 a.m. on that rainy Monday morning. It landed on its right side, crushing a fence surrounding a field and spilling its contents. South Hadley Police Officer Jeff Goulet, Sgt. Bob Whelihan and Detective McClair Mailhott responded to the accident. Both South Hadley fire districts 1 and 2 were on scene to assist. Although it was not completely full of dairy, some milk did leak out of the tractor trailer truck, in addition to a large amount of engine oil, said South Hadley Police Lt. Steven Parentela. Fortunately, the fuel tanks did not rupture, which was a concern, said South Hadley Fire District 1 Chief Robert Authier. “When we arrived, we had engine fluid leaking down toward the river, not helped by the rain,” he said. Crews were able to contain the spilled milk and prevent it from flowing into the Connecticut River, which would have caused a problem for the marine life in the river. Unfortunately, some the same could not be said for the engine oil, especially “with the rain diluting it,” said Authier. Emergency crews received help from Luke Brunelle, of Brunelle’s Marina, in setting up a hard buoy to protect the river water from any additional runoff. The Massachusetts Department of Environmental Protection (MassDEP) was called to the scene to inspect. The Massachusetts State Police Truck Team arrived on scene to investigate the accident. The South Hadley Conservation Commission was notified, as was the State Health Department, which also responded to the scene. The Granby Fire Department assisted the South Hadley departments with absorbent materials. Tools such as absorbent paper and “pigs” – absorbent devices used to contain liquid in one place – were laid down, as well as sand from the South Hadley Department of Public Works. Private companies were hired to remove and dispose of the absorbent instruments. Alvord Street remained closed for the rest of Monday and again Tuesday while the cleanup effort continued. 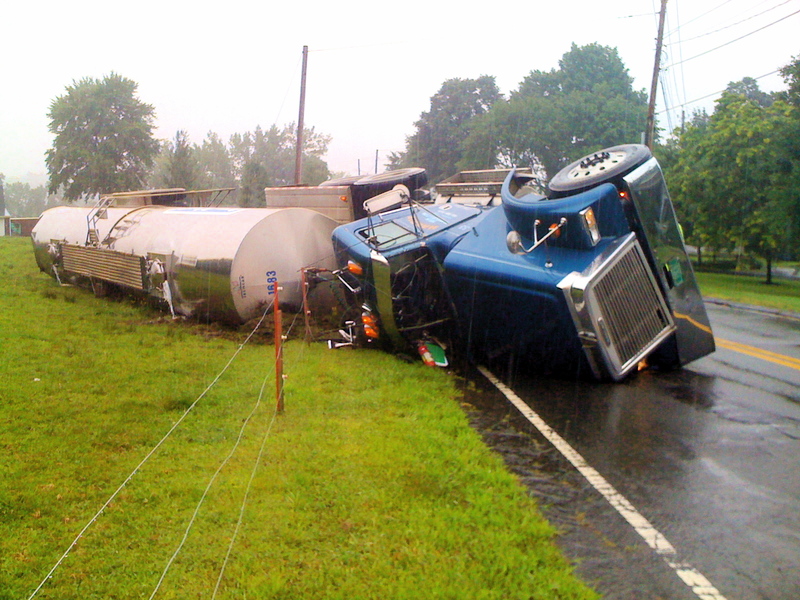 The driver of the Harris Milk tractor trailer truck, a 42-year-old Belchertown man, was cited for speeding. He was transported to Holyoke Medical Center for minor, non life-threatening injuries.